I spotted this flyer around town and I found it to be in such extreme poor taste, I had to take a picture. The poster is promoting a local music event. An atomic bomb with radioactive eyes gives a big cheerful thumbs up, the year 1945 appears on the tail. Looks like someone was trying to come up with one of those ironic logos but settled on something totally un-PC instead. Maybe it's just me but the combination of the name 'Nagasaki' along with the image of a bomb doesn't really make me want to go rock out at a club. For some reason, I can't shake the association with 75,000 dead civilians. 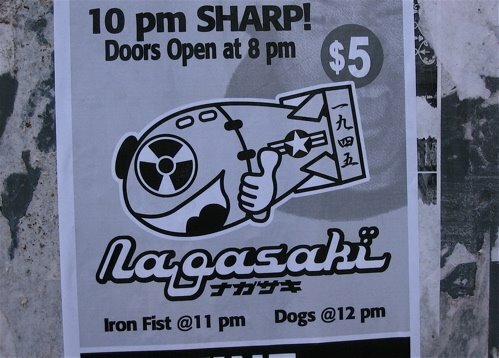 Then, I went to the website listed on the poster and found that the logo is for a band which is composed of three heavy metal hosers (one of whom has the surname Nagasaki) and that they will be performing at the Bovine soon. I suppose metal heads are always drawn to images and ideas that others find repulsive. I'd be expecting too much of these metal dudes to use better judgment and taste in their promotional materials, maybe? The poster sure gave me a sick feeling and that was probably the goal (I know I'm not the target audience for these flyers). I guess I should just get over it, yeah? What do you think? Okay, so I'm not the only one who feels that way. Good. The poster that I photographed happened to be right in front of the big Korean supermarket on Bloor. I shop there often and I know that a lot of Japanese people do, too, because of all the imported Japanese foods for sale. I'm glad to say it's rare to see that kind of offensive image in Toronto. polka has the... errrr yeah polka doesn't sell. mmm, start a band called "United 175"? It was the second plane.